[dropcap]T[/dropcap]his villa invites you to gather in the main living spaces – the beautiful vaulted ceiling living and dining area, or al fresco poolside with panoramic views. Five bedrooms spread across several different levels all offer private balconies with delightful views. Manicured grounds, modern Thai-style salas and an infinity pool all add the allure of this heavenly property. All for the price of a few hotel rooms! [dropcap]P[/dropcap]huket’s mountainous jungles make for a spectacular view across the coconut groves and farm land of NaiHarn. This luxury villa has the whole package – massive infinity pool surrounded by covered terraces and comfortable, elegant furniture. Inside is also first class all the way: spacious rooms with high ceilings, a magnificent dining area, well-finished bedrooms, even your own pool table. And the best part? For Phuket villas, it’s one of the best bargains on the island. [dropcap]F[/dropcap]or a large group, this top-class villa is an excellent option. Five-star accommodation, five-star professional service, yet “deal” prices – they have it all. These magnificent villas were built in a grand scale, with large hallways, a massive pool area and many private bungalow-bedrooms throughout the compound. Well-manicured gardens give this airy property its distinctive al fresco living appeal. As if more was required, panoramic views from your many private pool-side seating areas can be said to steal the show. This Amazing Property Sets the Standard for Phuket Villas. 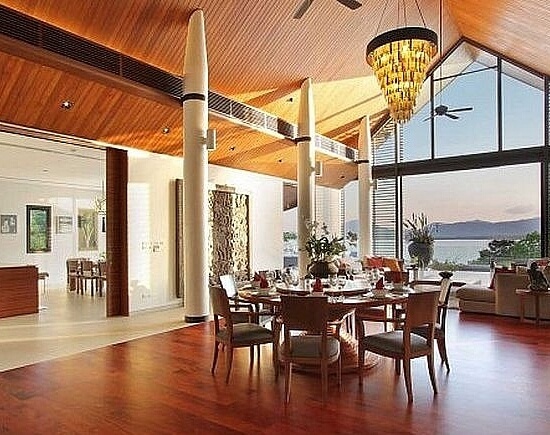 [dropcap]O[/dropcap]ff the beaten path in Phuket’s North East, lies a phenomenal villa. Get far from the madding crowds of Phuket’s west coast and instead take in amazing sun rises and breath-taking island views. Panoramic vistas of PhangNga’s mysterious islands are the centerpiece, but not a detail has been ignored in this modern-style mountain-top pool Villa. Well planned, open-living style, modern luxury and all for a bargain price. When it comes to Phuket villas, the hidden gem of this entire category may be this north-eastern Phuket property. [dropcap]T[/dropcap]raditional Thai gets a modern make-over in the lovely manicured grounds, the architecture as well as the regional artwork and furnishings. But the exclusive nature of this villa isn’t just in the property. This villa comes with a full-time staff, including your own private chef. Phuket villas come in all varieties, but few have the combination of style and luxury this property provides. All of this offered at bargain prices, it’s hard to resist!